I used to think that February was the winter month of bitter cold, living here in Maryland, but this winter has proven that January can be just as cold. For the last 10 days or so we’ve had temperatures in the single digits but then it decided to warm up for this week. I don’t know about you, but when I think of winter, I think of comfort foods. Hot, hearty foods that not only fill you up but warm you up as winter is doing her worst. 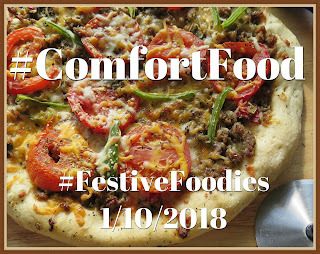 I’m joining up with the other bloggers of #FestiveFoodies today and sharing a comfort food recipe with you. 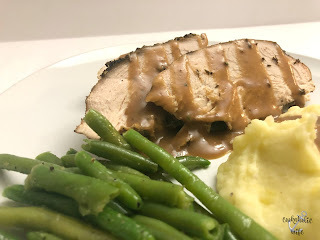 Until this past Thanksgiving, I had never thought to make a turkey breast in the crock pot. We don’t eat a lot of turkey (unless its ground, or Thanksgiving) so I guess that’s why it never occurred to me. But now that I’ve done it twice, I can tell you, I’m hooked. It’s so much easier than cooking it in the oven and your house smells absolutely amazing while it’s cooking in the crock pot. Comfort food and a Thanksgiving staple combine in this Crock Pot Turkey Breast and Gravy recipe where your slow cooker does all of the work for you. Place the onion, carrots and celery in the bottom of a 6 quart crock pot. Pour the chicken broth on top. Remove the skin from the turkey breast as it will not get crispy in the crock pot. Rub the dry rub mixture all over the turkey breast and place breast side down in the crock pot, making sure that it sits up on the vegetables. Add the cubes of butter on top of the turkey breast. Cook on high for 1 hour then turn to low and cook 4-5 hours more or until a thermometer inserted in the center of the breast reaches a temperature of 165 degrees. Remove the turkey breast from the oven and allow to rest on a cutting board for a few minutes. Strain 2 cups of the cooking liquid from the crock pot and discard any solids. Melt the butter in a medium skillet over medium heat. Whisk in the flour and then slowly stream in the cooking liquid, whisking constantly, until a gravy of your desired consistency is reached. Season to taste with salt and pepper. 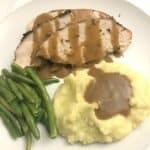 Cut the turkey breast into slices, plate and drizzle the gravy on top. The turkey turned out perfectly! 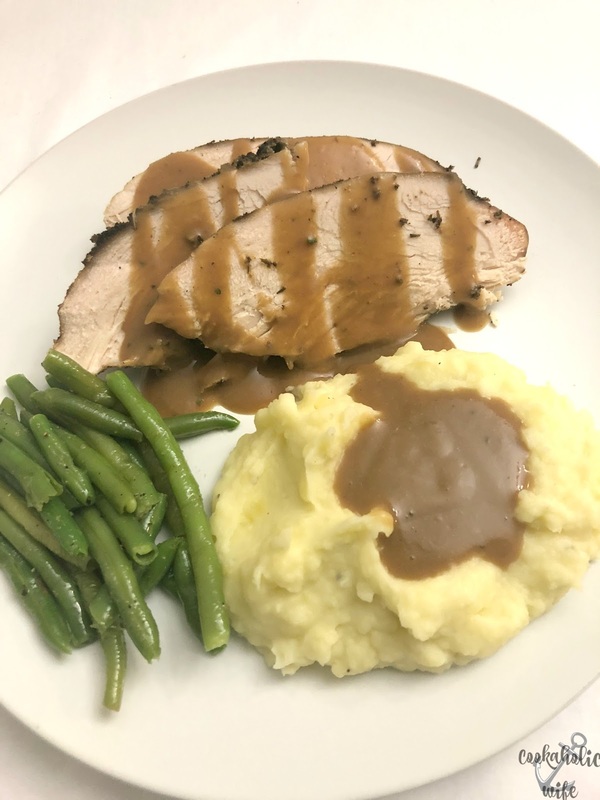 It was juicy and flavorful and with mashed potatoes it made the perfect comfort food on a cold day. Cheesesteak Pizza from Cindy’s Recipes and Writings. Creole Jambalaya from Caroline’s Cooking. General Tso’s Chicken from Palatable Pastime. Homemade “Hot Pocket” Sandwiches from Frugal Pantry. Italian Sausage Minestrone from Jolene’s Recipe Journal. Lighter Chicken Pot Pie from Kate’s Recipe Box. Turkey Sausage & Penne Skillet from Amy’s Cooking Adventures. Mmmmmmm…this could easily be one my favorite comfort foods! Turkey can make any day feel like a holiday! I'm up for turkey anytime. I love that you used a crockpot! Nichole, this is a wonderful idea and perfect when making turkey for just a few people instead of a crowd. I just love that the turkey is made in the crockpot! This is an awesome recipe! 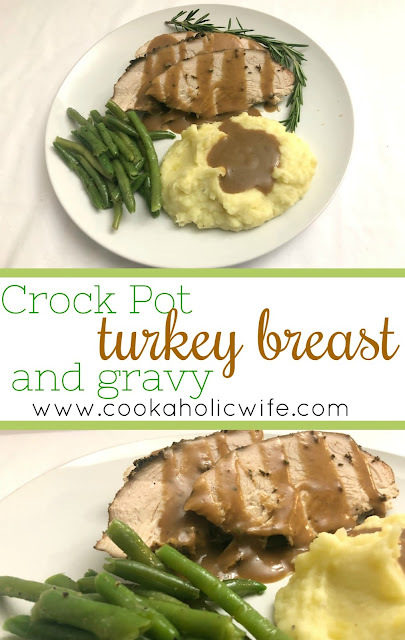 I really need to make better use of my crockpot, this looks amazing! Oh my goodness – this looks amazing! Turkey isn't just for November and makes a great comforting supper. Love that you posted this! Slow cooked meals seem to do well at creating tasty comfort food. Sounds good.